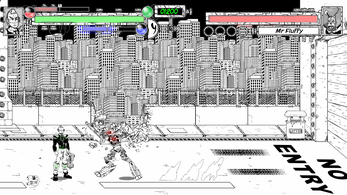 The Man Called Merc is a side-scrolling beat ‘em up, where players control the titular Merc, a mysterious and deadly man-for-hire, as he fights his way through hordes of cybernetic monstrosities in the fictional Talgore City. Usually found on an assassination mission, or an intricately plotted bank robbery, the Merc has had a slow month of few job opportunities, and is currently working as a part-time nightclub bouncer. One non-descript night, and without reason, all hell breaks loose as the city suddenly erupts into chaos as legions of cyborg and mechanical killing machines begin destroying everything in their path. The Merc kicks into action, and begins his unexpected journey across the city to learn the origin of this chaos. 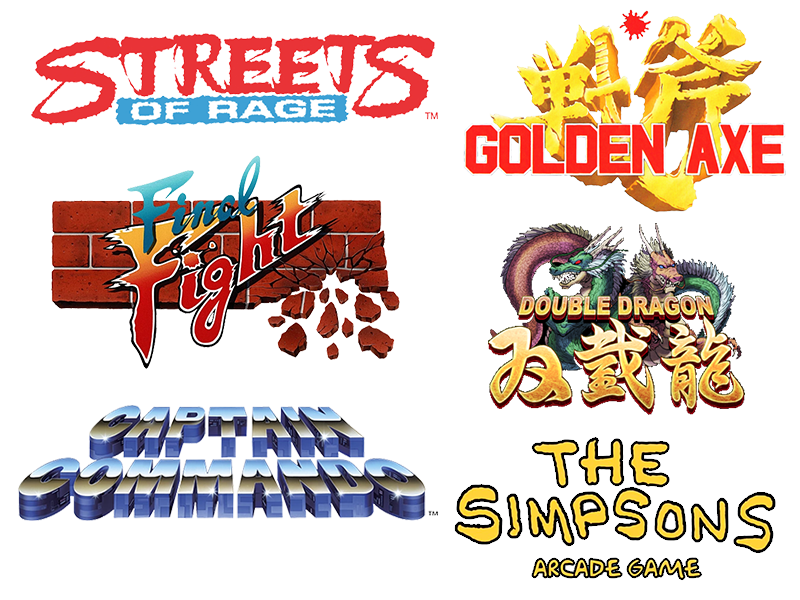 Taking inspiration from classic beat ‘em up and hack and slash games like Streets of Rage, Golden Axe and Final Fight, players can use the Merc’s array of abilities and weaponry to cut and blast his way through everything programmed to kill him. 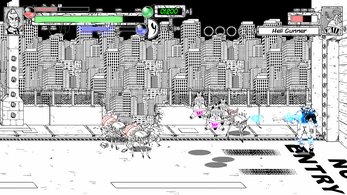 Like these classic games, players move around levels freely in a 2D fashion, as enemies attack from the front and rear. The Merc can use his sword for close-quarters combat, and his gun for long-range attacks, keeping a safe distance between him and danger. 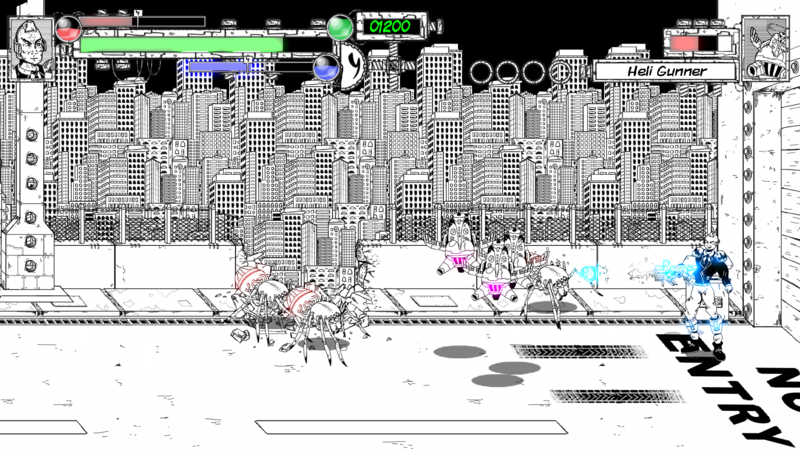 After reaching the end of a level, the Merc must face off against a boss. 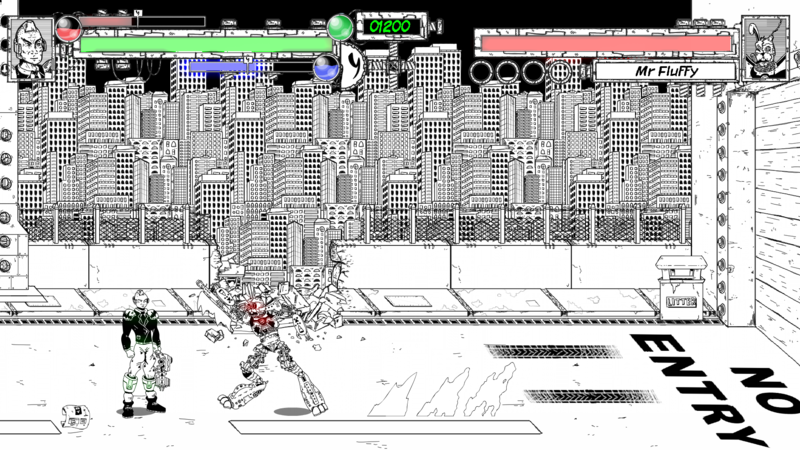 The Merc can make use of nyon, a powerful energy source that the futuristic city of Talgore City uses. 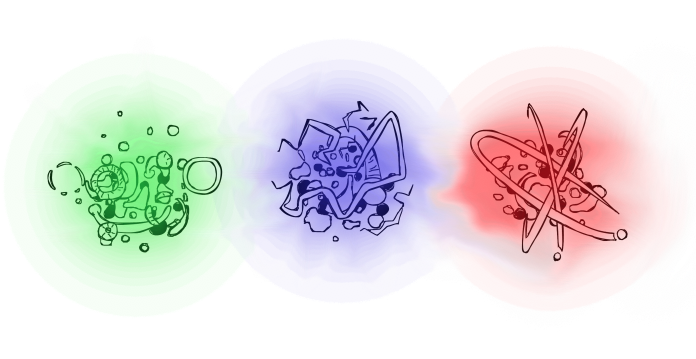 It comes in three varieties: green, blue, and red. 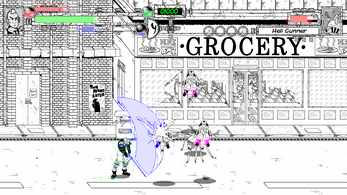 Green nyon helps restore the Merc’s health, which, if already full, can be stored and collected for later use as an automated reviving ability should he perish -- you get one life in this game, so must make use of green nyon to save you from the game ending; blue nyon allows the Merc to charge his weaponry before striking to beef up their damage and effects considerably; red nyon gives the Merc fantastic agility, allowing him to dash across the level to escape danger, or land sneak strikes to unexpected enemies. 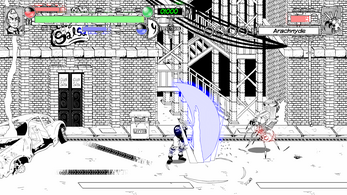 The game’s visuals are stylised in a noir graphic novel style, making use of a black and white art style, with the only colours being emitted from the nyon energy found throughout the city. Keeping with the art style, the game’s story is also told in graphic novel fashion between levels, slowly unfurling the mystery. Largely inspired by the works of graphic novel writers and artists such as Alan Moore, Frank Millar, and Robert Kirkman. 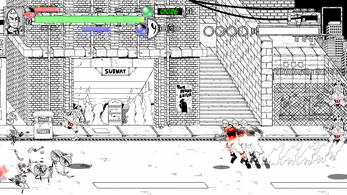 Classic beat ‘em up gameplay: slash and shoot your way through wave after wave of enemies. Mix and match close-quarters combat with long-range shooting, using the Merc’s sword and gun expertise. Collect power-ups known as nyon to restore health, boost attacks, and increase mobility. Make use and combine all of their features to leave no enemy left standing. 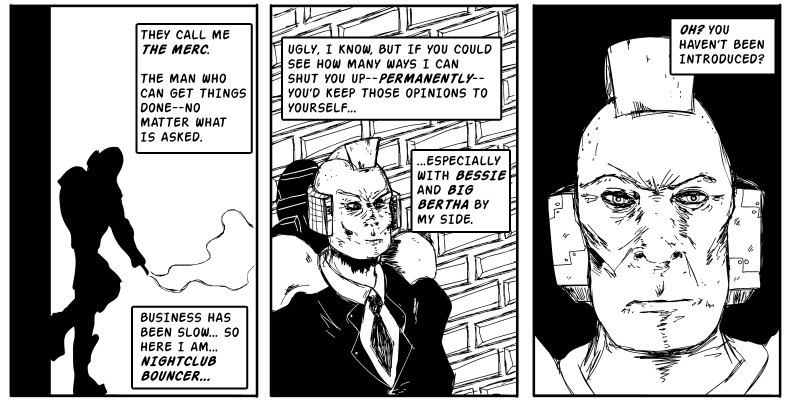 Taking inspiration from noir graphic novels, the visuals and story play out in a stylistic black and white, comic book fashion, that gives unique and quirky character, enemy, and environment design. Full game will feature four levels of difficulty, and a horde of unlockable modes, giving players more reason to master each level. 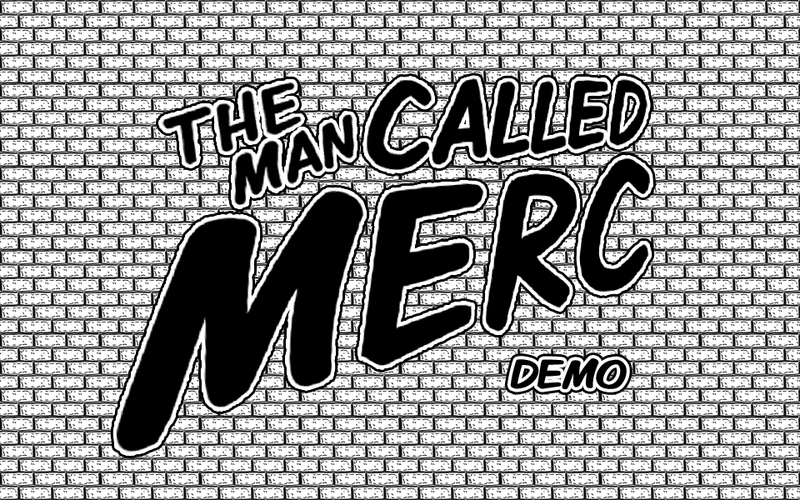 The Man Called Merc currently has support for keyboard, keyboard & mouse, PS4 controller, and Xbox One controllers. 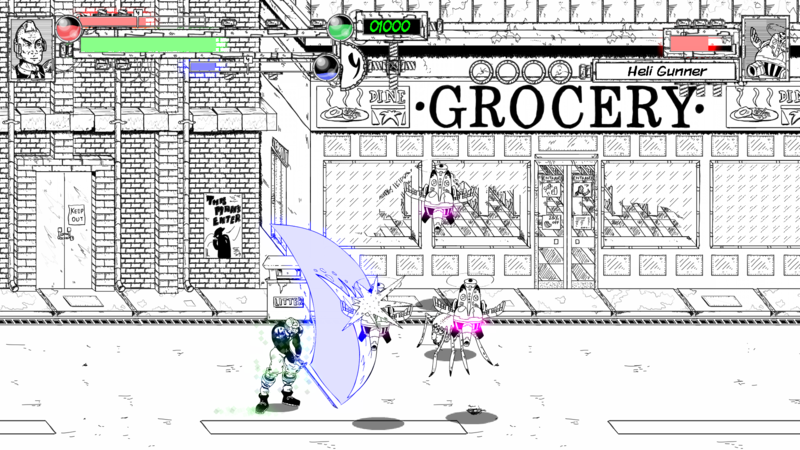 There are two control types: Arcade and Advanced, which control how the Merc uses his weaponry. 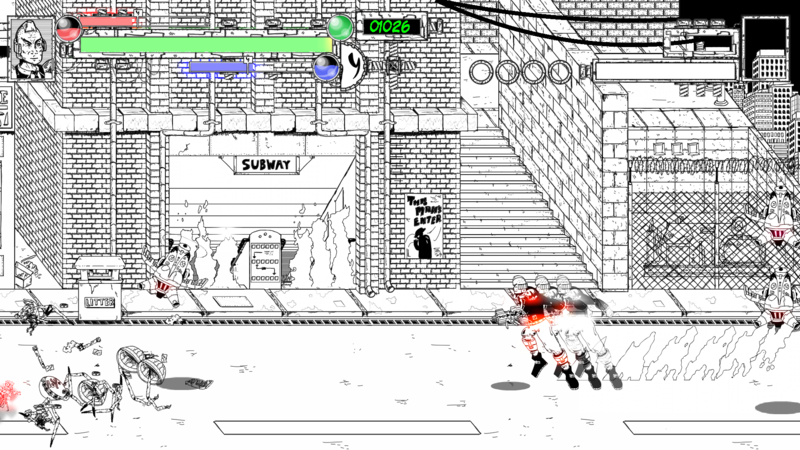 Arcade: allows you to immediately attack with either the sword or the gun by pressing the specific key/button. The Merc will attack using that weapon in the direction he is facing. Advanced: gives you precision of your attacks by giving you immediate control over the direction you want to attack. In this mode, you switch between the sword and gun with a key/button. Okay so I've played it. Its fun! and like the guy said at the bottom those controls are going to need fixing. a lot of fixing. Thanks for taking your time to play our demo, it means a lot. Don't worry, we've already updated and fixed the controls so they feel so much more tight. I hope you changed the attack buttons... I mean Its okay to be innovative but sometimes you can kick it old school. What I mean is you can have one button to attack and the others do something else. Is this game still being Develop? 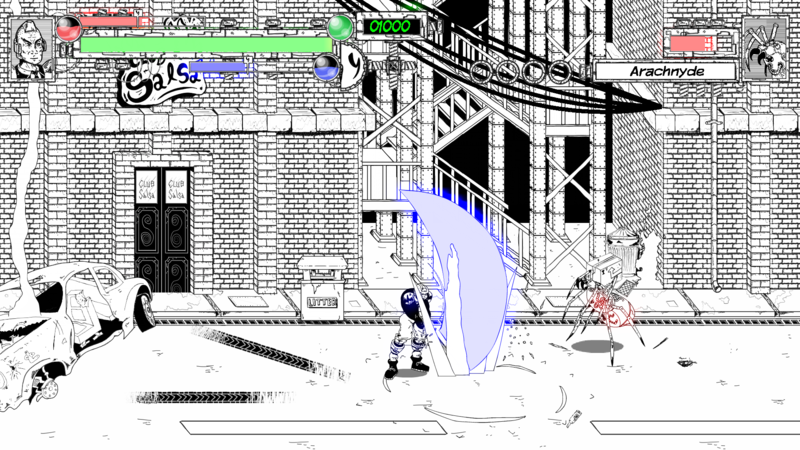 Yeah the game is still being developed, we're hoping to update the demo to reflect all our new changes very soon. I like the graphics, the story it's nice, but the gameplay needs to be fixed and then this could be a very good game! Thanks, kanetsu, for the Let's Play preview for our demo! Yeah, it's still very much work in progress, and are currently hard at work adding a tonne of new features, abilities, levels, modes, and tidying and cleaning up the gameplay to play at its best. We released this demo to basically get a little word out about our game and our company, and to give you a glimpse into what is to come. Again, thanks for taking the time to play it, and for the constructive criticism! Keep up the good work, I'm sure you will be able to make an amazing game! Good luck!